Rome Sep 15 (IANS) Pope Francis was in Sicily on Saturday to mark the 25th anniversary of the killing of a priest at the hands of a local criminal organization. Giuseppe "Pino" Puglisi was shot and killed on the orders of the local mafia "Cosa Nostra" ("Our Thing") on his 56th birthday in the city of Palermo in 1993. The perpetrators were sentenced to life in prison the BBC reported. The priest was renowned for working with young people to keep them away from drugs and the mafia. The Pope addressed the faithful at Palermo s Piazza Europa and was scheduled to visit Puglisi s parish in the working-class neighbourhood of Brancaccio. "Be afraid of the deafness of not listening to people. Listening to people is what Father Pino (Puglisi s nickname) did poor among the poor of his land " he said. Italian President Sergio Mattarella said: "The Republic recognizes in Puglisi the civil martyr who died for those values of solidarity justice equality and respect for the inviolable rights of the person." The priest s murder came at a time when mafia violence against opponents of their influence was of particularly grave concern. Puglisi was declared a "martyr" who was "killed by hatred of the faith" by Pope Francis predecessor Benedict XVI in 2012. He was beatified five years ago. 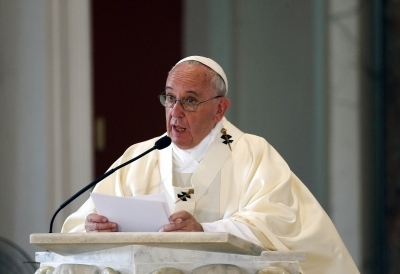 Pope Francis has previously denounced the mafia calling for the excommunication of mobsters.